This article is about the river on the Atlantic coast of the United States. For other uses, see Delaware River (disambiguation). The Delaware River is a major river on the Atlantic coast of the United States. It drains an area of 14,119 square miles (36,570 km2) in five U.S. states: Delaware, Maryland, New Jersey, New York, Pennsylvania. Rising in two branches in New York state's Catskill Mountains, the river flows 419 miles (674 km) into Delaware Bay where its waters enter the Atlantic Ocean near Cape May in New Jersey and Cape Henlopen in Delaware. Not including Delaware Bay, the river's length including its two branches is 388 miles (624 km). The Delaware River is one of nineteen "Great Waters" recognized by the America's Great Waters Coalition. The Delaware River rises in two main branches that descend from the western flank of the Catskill Mountains in New York. The West Branch begins near Mount Jefferson in the Town of Jefferson in Schoharie County. The river's East Branch begins at Grand Gorge near Roxbury in Delaware County. These two branches flow west and merge near Hancock in Delaware County, and the combined waters flow as the Delaware River south. Through its course, the Delaware River forms the boundaries between Pennsylvania and New York, the entire boundary between New Jersey and Pennsylvania, and most of the boundary between Delaware and New Jersey. The river meets tide-water at the junction of Morrisville, Pennsylvania, and Trenton, New Jersey, at the Falls of the Delaware. The river's navigable, tidal section served as a conduit for shipping and transportation that aided the development of the industrial cities of Trenton, Camden, and Philadelphia. The mean freshwater discharge of the Delaware River into the estuary of Delaware Bay is 11,550 cubic feet per second (327 m3/s). Before the arrival of European settlers, the river was the homeland of the Lenape Native Americans. They called the river Lenapewihittuk, or Lenape River, and Kithanne, meaning the largest river in this part of the country. In 1609, the river was first visited by a Dutch East India Company expedition led by Henry Hudson. Hudson, an English navigator, was hired to find a western route to Cathay (present-day China), but his discoveries set the stage for Dutch colonization of North America in the 17th century. Early Dutch and Swedish settlements were established along the lower section of river and Delaware Bay. Both colonial powers called the river the South River, compared to the Hudson River, which was known as the North River. After the English expelled the Dutch and took control of the New Netherland colony in 1664, the river was renamed Delaware after Sir Thomas West, 3rd Baron De La Warr, an English nobleman and the Virginia colony's first royal governor who defended the colony during the First Anglo-Powhatan War. The Delaware River is named in honor of Thomas West, 3rd Baron De La Warr (1577–1618), an English nobleman and the Virginia colony's first royal governor who defended the colony during the First Anglo-Powhatan War. Lord de la Warr waged a punitive campaign to subdue the Powhatan after they had killed the colony's council president, John Ratcliffe, and attacked the colony's fledgling settlements. Lord de la Warr arrived with 150 soldiers in time to prevent colony's original settlers at Jamestown from giving up and returning to England and is credited with saving the Virginia colony. The name of barony (later an earldom) is pronounced as in the current spelling form "Delaware" (/ˈdɛləwɛər/ ( listen) DEL-ə-wair) and is thought to derive from French de la Guerre. It has often been reported that the river and bay received the name "Delaware" after English forces under Richard Nicolls expelled the Dutch and took control of the New Netherland colony in 1664. However, the river and bay were known by the name Delaware as early as 1641. The state of Delaware was originally part of the William Penn's Pennsylvania colony. In 1682, the Duke of York granted Penn's request for access to the sea and leased him the territory along the western shore of Delaware Bay which became known as the "Lower Counties on the Delaware." In 1704, these three lower counties were given political autonomy to form a separate provincial assembly, but shared its provincial governor with Pennsylvania until the two colonies separated on June 15, 1776 and remained separate as states after the establishment of the United States. The name also became used as a collective name for the Lenape, a Native American people (and their language) who inhabited an area of the basins of the Susquehanna River, Delaware River, and lower Hudson River in the northeastern United States at the time of European settlement. As a result of disruption following the French & Indian War, American Revolutionary War and later Indian removals from the eastern United States, the name "Delaware" has been spread with the Lenape's diaspora to municipalities, counties and other geographical features in the American Midwest and Canada. The West Branch of the Delaware River (also called the Mohawk Branch) spans approximately 90 miles (140 km) from the northern Catskill Mountains to where it joins in confluence with the Delaware River's East Branch at Hancock, New York. The last 6 miles (9.7 km) forms part of the boundary between New York and Pennsylvania. The West Branch rises in Schoharie County, New York at 1,886 feet (575 m) above sea level, near Mount Jefferson, and flows tortuously through the plateau in a deep trough. The branch flows generally southwest, entering Delaware County and flowing through the towns of Stamford and Delhi. In southwestern Delaware County it flows in an increasingly winding course through the mountains, generally southwest. At Stilesville the West Branch was impounded in the 1960s to form the Cannonsville Reservoir, the westernmost of the reservoirs in the New York City water system. It is the most recently constructed New York City reservoir and began serving the city in 1964. Draining a large watershed of 455 square miles (1,180 km2), the reservoir's capacity is 95.7 billion US gallons (362,000,000 m3). This water flows over halfway through the reservoir to enter the 44-mile (71 km) West Delaware Tunnel in Tompkins, New York. Then it flows through the aqueduct into the Rondout Reservoir, where the water enters the 85 miles (137 km) Delaware Aqueduct, that contributes to roughly 50% of the city's drinking water supply. At Deposit, on the border between Broome and Delaware counties, it turns sharply to the southeast and is paralleled by New York State Route 17. It joins the East Branch at 880 feet (270 m) above sea level at Hancock to form the Delaware. Similarly, the East Branch begins from a small pond south of Grand Gorge in the town of Roxbury in Delaware County, flowing southwest toward its impoundment by New York City to create the Pepacton Reservoir, the largest reservoir in the New York City water supply system. Its tributaries are the Beaver Kill River and the Willowemoc Creek which enter into the river ten miles (16 km) before the West Branch meets the East Branch. The confluence of the two branches is just south of Hancock. Both the East Branch and West Branch of the Delaware River parallel each other, both flowing in a southwesterly direction. From Hancock, New York, the river flows between the northern Pocono Mountains in Pennsylvania, and the lowered shale beds north of the Catskills. The river flows down a broad Appalachian valley, passing Hawk's Nest overlook on the Upper Delaware Scenic Byway. The river flows southeast for 78 miles through rural regions along the New York-Pennsylvania border to Port Jervis and the Shawangunk Mountains. At Port Jervis, New York, it enters the Port Jervis trough. At this point, the Walpack Ridge deflects the Delaware into the Minisink Valley, where it follows the southwest strike of the eroded Marcellus Formation beds along the Pennsylvania–New Jersey state line for 25 miles (40 km) to the end of the ridge at Walpack Bend in the Delaware Water Gap National Recreation Area. The Minisink is a buried valley where the Delaware flows in a bed of glacial till that buried the eroded bedrock during the last glacial period. It then skirts the Kittatinny ridge, which it crosses at the Delaware Water Gap, between nearly vertical walls of sandstone, quartzite, and conglomerate, and then passes through a quiet and charming country of farm and forest, diversified with plateaus and escarpments, until it crosses the Appalachian plain and enters the hills again at Easton, Pennsylvania. From this point it is flanked at intervals by fine hills, and in places by cliffs, of which the finest are the Nockamixon Rocks, 3 miles (5 km) long and above 200 feet (61 m) high. The Appalachian Trail, which traverses the ridge of Kittatinny Mountain in New Jersey, and Blue Mountain in Pennsylvania, crosses the Delaware River at the Delaware Water Gap near Columbia, New Jersey. At Easton, Pennsylvania, the Lehigh River enters the Delaware. At Trenton there is a fall of 8 feet (2.4 m). Below Trenton the river flows between Philadelphia and New Jersey before becoming a broad, sluggish inlet of the sea, with many marshes along its side, widening steadily into its great estuary, Delaware Bay. The Delaware River constitutes the boundary between Delaware and New Jersey. 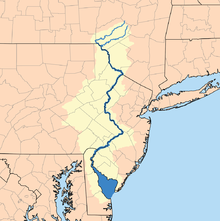 The Delaware-New Jersey border is actually at the easternmost river shoreline within the Twelve-Mile Circle of New Castle, rather than mid-river or mid-channel borders, causing small portions of land lying west of the shoreline, but on the New Jersey side of the river, to fall under the jurisdiction of Delaware. The rest of the borders follow a mid-channel approach. 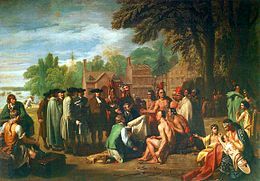 Benjamin West's painting The Treaty of Penn with the Indians' (1771–1772), depicts the 1683 peace treaty at Shackamaxon between William Penn and Tamanend, the chief of the Lenape's "Turtle Clan." Voltaire referred to it as "the only treaty never sworn to and never broken." At the time of the arrival of the Europeans in the early 17th century, the area near the Delaware River was inhabited by the Native American Lenape people. They called the Delaware River "Lenape Wihittuck", which means "the rapid stream of the Lenape". The Delaware River played a key factor in the economic and social development of the Mid-Atlantic region. In the seventeenth century it provided the conduit for colonial settlement by the Dutch (New Netherland), the Swedish (New Sweden). Beginning in 1664, the region became an English possession as settlement by Quakers established the colonies of Pennsylvania (including present-day Delaware) and West Jersey. In the eighteenth century, cities like Philadelphia, Camden (then Cooper's Ferry), Trenton, and Wilmington, and New Castle were established upon the Delaware and their continued commercial success into the present day has been dependent on access to the river for trade and power. The river provided the path for the settlement of northeastern Pennsylvania's Lehigh Valley, and northwestern New Jersey by German Palatine immigrants—a population that became key in the agricultural development of the region. Washington Crossing the Delaware by Emanuel Leutze, 1851. Oil on canvas. Metropolitan Museum of Art, New York. Perhaps the most famous "Delaware Crossing" involved the improvised boat crossing undertaken by George Washington's army during the American Revolution's Battle of Trenton on the night of December 25–26, 1776, as part of a successful surprise attack on Hessian troops occupying Trenton, New Jersey. The magnitude of the commerce of Philadelphia has made the improvements of the river below that port of great importance. Small improvements were attempted by Pennsylvania as early as 1771. Commerce was once important on the upper river, primarily prior to railway competition (1857). The Delaware Division of the Pennsylvania Canal, running parallel with the river from Easton to Bristol, opened in 1830. The Delaware and Raritan Canal, which runs along the New Jersey side of the Delaware River from Bulls Island, New Jersey to Trenton, unites the waters of the Delaware and Raritan rivers as it empties the waters of the Delaware River via the canal outlet in New Brunswick. This canal water conduit is still used as a water supply source by the State of New Jersey. The Morris Canal (now abandoned and almost completely filled in) and the Delaware and Hudson Canal connected the Delaware and Hudson rivers. The Chesapeake and Delaware Canal joins the waters of the Delaware with those of the Chesapeake Bay. The Delaware Water Gap National Recreation Area came about as a result of the failure of a controversial plan to build a dam on the Delaware River at Tocks Island, just north of the Delaware Water Gap to control water levels for flood control and hydroelectric power generation. The dam would have created a 37-mile (60 km) lake in the center of present park for use as a reservoir. Starting in 1960, the present day area of the Recreation Area was acquired for the Army Corps of Engineers through eminent domain. Between 3,000 and 5,000 dwellings were demolished, including historical sites, and about 15,000 people were displaced by the project. Because of massive environmental opposition, dwindling funds, and an unacceptable geological assessment of the dam's safety, the government transferred the property to the National Park Service in 1978. The National Park Service found itself as the caretaker of the previously endangered territory, and with the help of the federal government and surrounding communities, developed recreational facilities and worked to preserve the remaining historical structures. The nearby Shawnee Inn, was identified in the 1990s as the only resort along the banks of the Delaware River. In 1984, the U.S. Department of the Treasury authorized the creation of a wine region or "American Viticultural Area" called the Central Delaware Valley AVA located in southeastern Pennsylvania and New Jersey. The wine appellation includes 96,000 acres (38,850 ha) surrounding the Delaware River north of Philadelphia and Trenton, New Jersey. In Pennsylvania, it consists of the territory along the Delaware River in Bucks County; in New Jersey, the AVA spans along the river in Hunterdon County and Mercer County from Titusville, New Jersey, just north of Trenton, northward to Musconetcong Mountain. As of 2013, there are no New Jersey wineries in the Central Delaware Valley AVA. In the "project of 1885" the U.S. government undertook systematically the formation of a 26-foot (7.9 m) channel 600 feet (180 m) wide from Philadelphia to deep water in Delaware Bay. The River and Harbor Act of 1899 provided for a 30-foot (9.1 m) channel 600 feet (180 m) wide from Philadelphia to the deep water of the bay. Since 1941, the Delaware River Main Channel was maintained at a depth of 40 ft (12 m). A 102.5-mile stretch of this federal navigation channel, from Philadelphia and Camden to the mouth of the Delaware Bay, was deepened to 45 ft (14 m), in a projected completed in 2017. The Delaware River port complex refers to the ports and energy facilities along the river in the tri-state PA-NJ-DE Delaware Valley region. They include the Port of Salem, the Port of Wilmington, the Port of Chester, the Port of Paulsboro, the Port of Philadelphia and the Port of Camden. Combined they create one of the largest shipping areas of the United States.In 2015, the ports of Philadelphia, Camden, and Wilmington handled 100 million tons of cargo from 2,243 ship arrivals, and supported 135,000 direct or indirect jobs. The biggest category of imports was fruit, carried by 490 ships, followed by petroleum, and containers, with 410 and 381 ships, respectively. The biggest category of exports was of shipping was containers, with 470 ships. In 2016, 2,427 ships arrived at Delaware River port facilities. Fruit ships were counted at 577, petroleum at 474, and containerized cargo at 431. At one time it was a center for petroleum and chemical products and included facilities such as the Delaware City Refinery, the Dupont Chambers Works, Oceanport Terminal at Claymont, the Marcus Hook Refinery, the Trainer Refinery, the Paulsboro Asphalt Refinery,, Paulsboro Refinery, Eagle Point Refinery, and Sunoco Fort Mifflin. As of 2011, crude oil was the largest single commodity transported on the Delaware River, accounting for half of all annual cargo tonnage. The Dingman's Ferry Bridge connecting Sandyston Township, in Sussex County, New Jersey and Delaware Township in Pike County, Pennsylvania is the last privately owned toll bridge on the Delaware River and one of the last few in the United States. The Delaware River is a major barrier to travel between New Jersey and Pennsylvania. Most of the larger bridges are tolled only westbound, and are owned by the Delaware River and Bay Authority, Delaware River Port Authority, Burlington County Bridge Commission or Delaware River Joint Toll Bridge Commission. After New York City built 15 reservoirs to supply water to the city's growing population, it was unable to obtain permission to build an additional five reservoirs along the Delaware River's tributaries. As a result, in 1928 the city decided to draw water from the Delaware River, putting them in direct conflict with villages and towns across the river in Pennsylvania which were already using the Delaware for their water supply. The two sides eventually took their case to the U.S. Supreme Court, and in 1931, New York City was allowed to draw 440 million US gallons (1,700,000 m3) of water a day from the Delaware and its upstream tributaries. The Delaware River has been attached to areas of high pollution. The Delaware River in 2012 was named the 5th most polluted river in the United States, explained by PennEnvrionment and Environment New Jersey. The activist groups claim that there is about 7-10 million pounds of toxic chemicals flowing through the waterways due to dumping by DuPont Chambers Works. PennEnviornment also claims that the pollutants in the river can cause birth defects, infertility among women, and have been linked to cancer. In 2015, the EPA saw the Delaware River as a concern for mass pollution especially in the Greater Philadelphia and Chester, Pennsylvania area. The EPA was involved after accusations that the river met standards made illegal by the Clean Water Act. In complying with the Clean Water Act, the EPA involved the Delaware County Regional Water Authority (DELCORA) where they set up a plan to spend around $200 million to help rid the waterway of about 740 million gallons of sewage and pollution. DELCORA was also fined about $1.4 million for allowing the Delaware River to have so much pollution residing in the river in the first place and for not complying with the Clean Water Act. The Clean Water Act explains the importance of low pollution for human and species health. One of the sectors in the Clean Water Act explains how conditions of the river should be stable enough for human fishing and swimming. Even though the river has had success with the cleanup of pollution, the Delaware River still does not meet that standard of swimmable or fishable conditions in the Philadelphia/ Chester region. With the failure of the dam project to come to fruition, the lack of flood control on the river left it vulnerable, and it has experienced a number of serious flooding events as the result of snow melt or rain run-off from heavy rainstorms. Record flooding occurred in August 1955, in the aftermath of the passing of the remnants of two separate hurricanes over the area within less than a week: first Hurricane Connie and then Hurricane Diane, which was, and still is, the wettest tropical cyclone to have hit the northeastern United States. The river gauge at Riegelsville, Pennsylvania recorded an all-time record crest of 38.85 feet (11.84 m) on August 19, 1955. More recently, moderate to severe flooding has occurred along the river. The same gauge at Riegelsville recorded a peak of 30.95 feet (9.43 m) on September 23, 2004, 34.07 feet (10.38 m) on April 4, 2005, and 33.62 feet (10.25 m) on June 28, 2006, all considerably higher than the flood stage of 22 feet (6.7 m). Since the upper Delaware basin has few population centers along its banks, flooding in this area mainly affects natural unpopulated flood plains. Residents in the middle part of the Delaware basin experience flooding, including three major floods in the three years (2004–2006) that have severely damaged their homes and land. The lower part of the Delaware basin from Philadelphia southward to the Delaware Bay is tidal and much wider than portions further north, and is not prone to river-related flooding (although tidal surges can cause minor flooding in this area). The Delaware River Basin Commission, along with local governments, is working to try to address the issue of flooding along the river. As the past few years have seen a rise in catastrophic floods, most residents of the river basin feel that something must be done. The local governments have worked in association with FEMA to address many of these problems, however, due to insufficient federal funds, progress is slow. A number of oil spills have taken place in the Delaware over the years. The National Marine Fisheries Service is considering designating sixteen rivers as endangered habitat for the Atlantic Sturgeon which would require more attention to be given to uses of the rivers that affect the fish. The river is part of the National Wild and Scenic Rivers System. ^ The main stem from Hancock, New York to the head of Delaware Bay is 301 miles (484 km). ^ National Wildlife Federation (August 18, 2010). "America's Great Waters Coalition". Retrieved August 18, 2011. ^ a b Pollard, Albert Frederick (1899). "West, Thomas (1577-1618)". In Lee, Sidney (ed.). Dictionary of National Biography. 60. London: Smith, Elder & Co. pp. 344–345. ^ Tyler, Lyon Gardiner, ed. (1915). Encyclopedia of Virginia Biography. I. New York: Lewis Historical Publishing Company. pp. 33–34. ^ Grenier, John (2005). The First Way of War: The American War-Making of the Frontier, 1607–1814. New York: Cambridge University Press. pp. 24–25. ISBN 0-521-84566-1. ^ Versteer, Dingman (editor). "New Amsterdam Becomes New York" in The New Netherland Register. Volume 1 No. 4 and 5 (April/May 1911): 49-64. ^ Evelin, Robert. A direction for Adventurers With small stock to get two for one, and good land freely : And for Gentleman, and all Servants, Labourers, and Artificers to live plentifully, And the true Description of the healthiest, pleasantest and richest plantation of New Albion in North Virginia. (London, s.n., 1641). ^ Munroe, John A. (2006). "Chapter 3. The Lower Counties On The Delaware". History of Delaware. Newark, Delaware: University of Delaware Press. p. 45. ISBN 0-87413-947-3. ^ Schutt, Amy C. (2007). Peoples of the River Valleys: The Odyssey of the Delaware Indians. Philadelphia: University of Pennsylvania Press. ISBN 978-0-8122-3993-5. ^ Weslager, Charles A. (1990). The Delaware Indians: A History. New Brunswick, New Jersey: Rutgers University Press. ISBN 0-8135-1494-0. ^ a b c d e f g h i Philadelphia Water Department. "Moving from Assessment to Protection…The Delaware River Watershed Source Water Protection Plan" (PWSID #1510001) Archived July 28, 2013, at the Wayback Machine (June 2007). Retrieved July 17, 2013. ^ White, Ron W.; Monteverde, Donald H. (February 2006). "Karst in the Delaware Water Gap National Recreation Area" (pdf). Unearthing New Jersey Vol. 2, No. 1. New Jersey Geological Survey. Retrieved June 7, 2008. ^ White, I.C. ; Chance, H.M. (1882). The geology of Pike and Monroe counties. Second Geol. Surv. of Penna. Rept. of Progress, G6. Harrisburg. pp. 17, 73–80, 114–115. ^ Delaware Water Gap National Recreation Area (p. 7-8), Obiso, Laura, 2008. ^ Delaware Water Gap National Recreation Area, njskylands.com. ^ "Shawnee Marking Golden Season". The Daily Record. Stroudsburg, Pennsylvania. June 17, 1960. ^ Shea, Barbara (September 11, 1994). "Let the current set the pace at the Delaware Water Gap". The Courier-News. Somerville, New Jersey. ^ The Wine Institute. "American Viticultural Areas by State" Archived January 27, 2008, at the Wayback Machine (2008). Retrieved February 5, 2008. ^ a b Code of Federal Regulations. Section 9.49 Central Delaware Valley. (27 CFR 9.49) from Title 27 - Alcohol, Tobacco Products and Firearms. CHAPTER I - ALCOHOL AND TOBACCO TAX AND TRADE BUREAU, DEPARTMENT OF THE TREASURY. SUBCHAPTER A - LIQUORS. PART 9 - AMERICAN VITICULTURAL AREAS. Subpart C - Approved American Viticultural Areas. Retrieved June 30, 2013. ^ New Jersey Division of Alcoholic Beverage Control. "New Jersey ABC list of wineries, breweries, and distilleries" (February 5, 2013). Retrieved May 2, 2013. An analysis was done comparing a list of wineries provided by the New Jersey Division of Alcoholic Beverage Control with the AVA's description in the Code of Federal Regulations. ^ One or more of the preceding sentences incorporates text from a publication now in the public domain: Chisholm, Hugh, ed. (1911). "Delaware River" . Encyclopædia Britannica. 7 (11th ed.). Cambridge University Press. p. 951. ^ United States Army Corps of Engineers. Delaware River Main Channel Deepening. Retrieved July 25, 2013. ^ Ruch, Robert J. Ruch (Lt. Col.), District Engineer, Philadelphia District. Delaware River Main Channel Deepening Project Delaware Valley Regional Planning Commission (January 20, 2005). Retrieved July 14, 2013. ^ a b U.S. Army Corps of Engineers. Delaware River Main Channel Deepening Project. (May 2012). Retrieved July 14, 2013. ^ Delaware Riverkeeper. The Delaware River Main Channel Deepening Project: Background Archived July 16, 2012, at the Wayback Machine. Retrieved July 14, 2013. ^ "Epic Effort to Deepen Delaware River Shipping Channel Nears End - NJ Spotlight". www.njspotlight.com. ^ "Murky Bottom: Will Deeper Delaware River Make Philly More Competitive? - NJ Spotlight". www.njspotlight.com. ^ "Delaware River Ports Fight For Market as Dredging Project Nears Completion - NJ Spotlight". www.njspotlight.com. ^ "Paulsboro Refinery". June 26, 2013. ^ Tuttle, Robert (February 3, 2017). "America's Biggest Asphalt Plant Is Shutting When the Country Might Need It Most". Bloomberg News. Retrieved February 4, 2017. ^ Renshaw, Jarrett (January 18, 2017). "Axeon plans to shutter New Jersey asphalt refinery: sources". Reuters. Retrieved February 4, 2017. ^ American Waterways. New Jersey A key link in the nation's import/export economy[permanent dead link]. Retrieve July 26, 2013. ^ a b “Environmental Group: Delaware River Tops List of Most Polluted Waterways.” The Advance of Bucks County, 29 Mar. 2012, www.buckslocalnews.com/news/environmental-group-delaware-river-tops-list-of-most-polluted-waterways/article_b94c90d5-a5c1-5c8e-b39d-2319fa2a511a.html. ^ Augenstein, Seth. “Delaware River Is 5th Most Polluted River in U.S., Environmental Group Says.” NJ.com, 5 Apr. 2012, www.nj.com/news/index.ssf/2012/04/delaware_river_is_5th_most_pol.html. ^ “Settlement to Improve Water Quality in Delaware River, Philadelphia-Area Creeks.” EPA, Environmental Protection Agency, 23 Aug. 2017, www.epa.gov/pa/settlement-improve-water-quality-delaware-river-philadelphia-area-creeks. ^ Delaware River Basin Commission (July 20, 2005). "Delaware River Basin Commission's Role in Flood Loss Reduction Efforts." Archived August 18, 2006, at the Wayback Machine West Trenton, NJ. ^ "Athos 1 Oil Spill". University of Delaware Sea Grant Program. November 3, 2005. Retrieved April 29, 2006. ^ "1985 Grand Eagle Oil Spill". University of Delaware Sea Grant Program. December 16, 2004. Retrieved April 29, 2006. ^ "Presidente Rivera Spill – June 24, 1989". University of Delaware Sea Grant Program. December 8, 2004. Retrieved April 29, 2006. ^ "Feds Move to Protect Endangered Atlantic Sturgeon in Delaware River - NJ Spotlight". www.njspotlight.com. Devastation on the Delaware: Stories and Images of the Deadly Flood of 1955 (2005, Word Forge Books, Ferndale, PA) The only comprehensive documentary of this weather disaster in the Delaware River Valley. "Delaware, a river of the United States" . Collier's New Encyclopedia. 1921. "Delaware River" . The New Student's Reference Work . 1914. "Delaware. A river of the Eastern United States" . New International Encyclopedia. 1905. Italics indicate a decommissioned site. This page was last edited on 11 April 2019, at 21:55 (UTC).